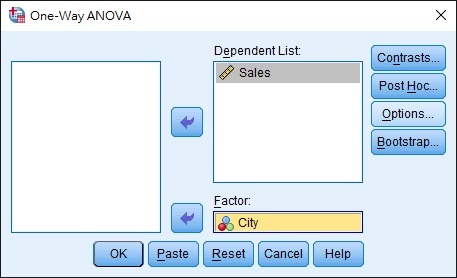 This SPSS Excel tutorial explains how to calculate One Way ANOVA in SPSS, Excel and manual calculation. To determine if a sample comes from a population, we use one sample t test or Z Score. To determine if two samples have the same mean, we use independent sample t test. To determine if differences exist between two or more population means, we use One Way ANOVA (abbreviation of one way analysis of variance). The test statistics is called F test, it requires that the random variable be normally distributed with equal variances. One Way ANOVA can be replaced by doing multiple t test, but the latter takes a lot more time. 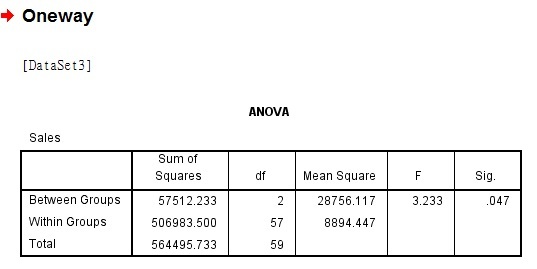 The main difference is that ANOVA has no direction, it only tells you whether there is a difference but it cannot tell whether one mean is larger than another. For example, we have collected 10 weekly sales data from the Supermarket A in three cities, we want to know if the mean sales are significantly different. 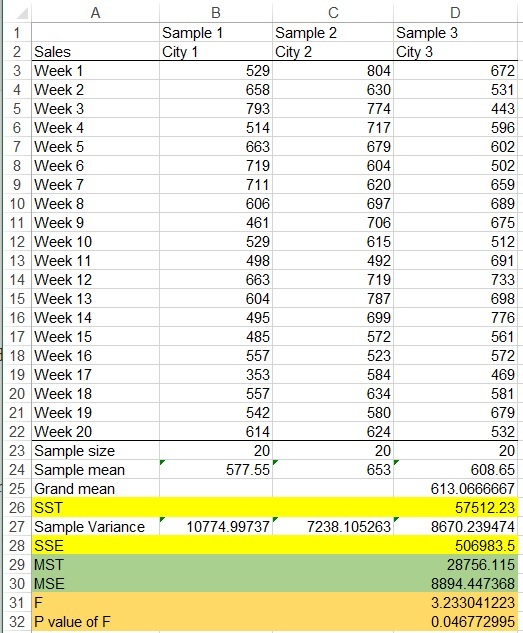 In order to calculate the test statistics to see if the difference is significant, the first Step is to calculate the SST. 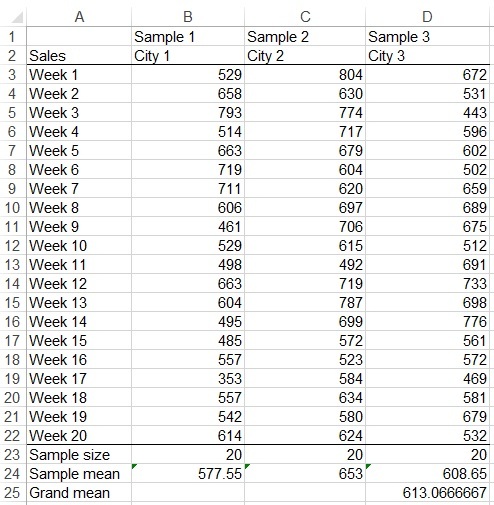 Calculate the sample mean for each sample and the grand mean of all data as below. You can see from the formula that if sample mean is similar to grand mean, then SST should be closed to zero. After calculating SST, the next step is to calculate SSE, which is basically a sum of variance of all samples. 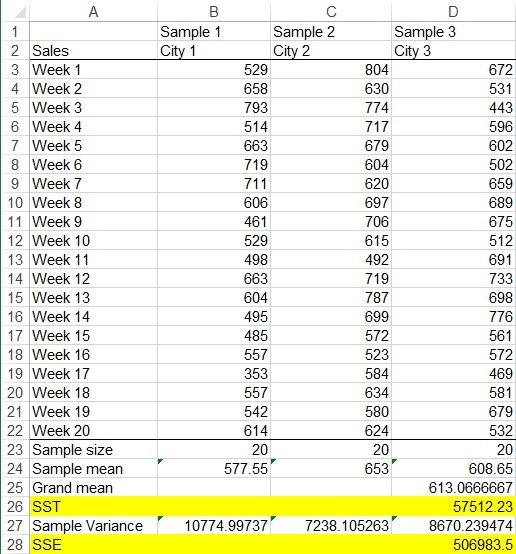 The first thing is to calculate the variance of each sample. To save time, use Excel Function VAR.S to calculate. Let’s summarize our results so far. Deg_freedom1 Required. The numerator degrees of freedom. Deg_freedom2 Required. The denominator degrees of freedom. Since P < 0.05, there is enough evidence to infer that the m ean weekly sales differ between the three cities. 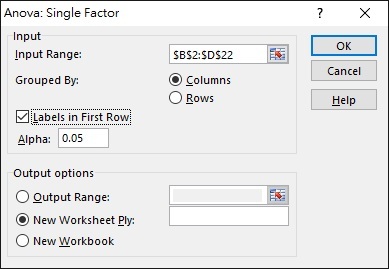 Select Dependent List and Factor as below. 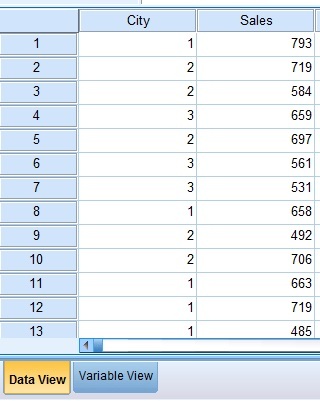 Now we have produced a similar table as Excel.